TORONTO - The federal government came through Monday with $660 million for the expansion of a subway line in east-end Toronto, suggesting its funding was more reliable than money promised by the province for a version of the project. The jab came as Ontario Premier Kathleen Wynne argued that the federal cash may never have surfaced if her government hadn't pledged to fund the majority of the project to begin with. 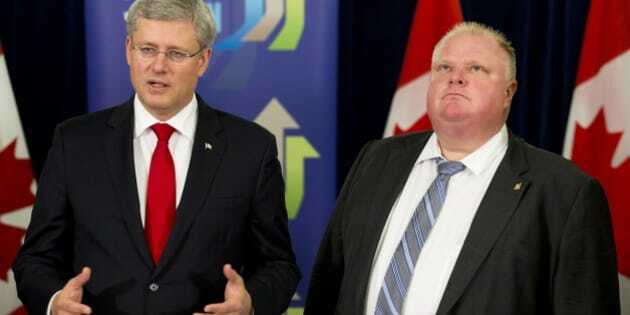 Finance Minister Jim Flaherty said the federal money came at the request of Toronto Mayor Rob Ford and city council. "The message from the government of Canada today is you have our money, now let's get this subway built," he said at a news conference in Toronto. While he hoped the province would co-operate with the city of Toronto and the federal government on the transit plan, Flaherty also took a clear shot at the minority provincial Liberal government. "I've seen lots of provincial plans and I've seen lots of provincial numbers about lots of transit projects. Our money is real, our money will flow, our government is solid, our finances are in order," he said. "I'll leave it to you to ask the province of Ontario how they're doing." A map at Flaherty's announcement showed a proposed three-stop subway that would extend the Bloor-Danforth subway line from Kennedy station up to the Sheppard subway line. The plan has been approved by the city of Toronto and is longer than a two-stop plan the province committed to earlier this month. A Toronto Transit Commission report released Monday afternoon recommended supporting the federally backed plan, which is expected to cost a total of $2.5 billion. The TTC report estimates the shorter provincial route is expected to cost $1.7 to $1.9 billion, but would require between $2.9 to $3 billion if it was extended to match the city approved plan. Wynne called the federal cash announcement on Monday a "positive development," but said there's "no doubt" in her mind that Ottawa wouldn't have come to the table if the province hadn't put up $1.4 billion for the shorter version of the transit route. It's "disconcerting" that the money isn't part of a broader national transit strategy, she said. "I hope what it leads to is that the federal government will now be able to take part in a systematic discussion of building transit in this region," Wynne said. "Ad hoc investments are not how you build infrastructure." Amidst the political sniping, Toronto's mayor lauded both his provincial and federal counterparts. "We now have all three levels of government at the table to build the subways that Scarborough has been waiting for a long, long time," Ford said. Ontario Transportation Minister Glen Murray wouldn't commit, however, to the plan backed by the city and Flaherty, saying the federal money is just a fraction of the project's total cost. He said he's willing to "be nice" and sit down with the federal government — even though he's not been able to get a meeting with them for six months — and city officials to sort it out. But the province doesn't want to start a project that it can't fund, Murray added. "While we welcome the money, we'll certainly engage them, we're not going to abandon a fully funded project for one that now has a 20 per cent contribution to it," he said. Both Murray and Ford had earlier requested Ottawa step up to the plate and help fund the transit extension. Meanwhile, TTC Chair Karen Stintz said she was optimistic the province would come around to back the plan supported by Flaherty. "I would expect the province to come to the table...and recognize that this is the right alignment...if they fail to do that then we're going to have to wrestle with it," she said. Toronto city council has the option to approve tax increases — ranging from 0.4 per cent up to two per cent — to help cover the outstanding cost of the transit plan once the final federal and provincial funding is added up, said Stintz. "If that's what it takes to get the subway built then that's what it's going to take," she said.